At first it was just Mike. At about 11:30pm on Oct. 8, KSRO radio producer and engineer Mike DeWald was finishing a game of hockey at Snoopy's Home Ice in Santa Rosa when he smelled smoke. Maybe the Zamboni was overheating, he thought. Heading for his home in Rohnert Park, DeWald's phone began to light up with messages about a fast-moving wildfire headed from Calistoga to Santa Rosa down Mark West Springs Road. He wasn't going home now. He turned around in Cotati and headed to the radio station in Santa Rosa. By the time he passed the Sonoma County Fairgrounds on Highway 12, he could see fire illuminating he night sky in the east. It looked like "the gates of hell opening up on the horizon," he says. When DeWald arrived at the KSRO studio on Neotomas Avenue, he was alone. DeWald is the producer of The Drive with Steve Jaxon, from 3pm to 6pm, and works behind the scenes. But he was ready to go on the air to report on the fires, the scale of which he did not yet comprehend. "I said, 'I guess I'm going to have to do this.' Just as I was about to do that, I saw movement in the parking lot. I thought, 'That's strange.' And a few seconds later, Pat Kerrigan walked in." DeWald quickly learned that Kerrigan, KSRO's 6–9am news anchor, had just been evacuated from her home in Kenwood. She was there with her wife and dog. "She said something like, 'Are you ready for this? Here we go.'" What followed in the chaotic, early hours of Oct. 9, as the fire lay waste to thousands of homes and displaced some 100,000 people, was an extraordinary moment in Sonoma County. Just after midnight, DeWald broke in on the syndicated broadcast of Coast to Coast AM, a talk show about UFOs, Bigfoot and all things paranormal, and Kerrigan began to report the little she knew about the fires. WAR ROOM Pat Kerrigan, left, emerged as the quarterback of KSRO’s North Bay fire coverage. Fifteen minutes later, Michelle Marques, a former news reporter and host of a community affairs show on KSRO, arrived. She lives in middle Rincon Valley and awoke to the smell of smoke the same moment DeWald texted her a photo of the fire with a message that it was burning from Calistoga to Santa Rosa. After alerting her roommate, Marques grabbed her passport, 2016 taxes, sketchbook, toothbrush and two pairs of underwear and headed out the door. What she saw terrified her. Fire was visible to the south, and to the north she saw Fountaingrove ablaze. "It was glowing red," Marques says, "but bright like the sun was coming up. There were huge visible flames coming up along the ridge." Like DeWald and Kerrigan, Marques knew she had to get to work. She drove through hot blowing wind, debris and smoke on her Vespa scooter, her only vehicle. "I was really terrified. I think I was hyperventilating." DeWald, 30, started at KRSO 13 years ago as an intern. Because of his nine years scheduling guests for The Drive with Steve Jaxon, DeWald's cell phone holds numbers to a who's who of Sonoma County. "I don't know everyone, but I know how to reach everyone," he says. He was soon lining up calls for Kerrigan and Marques with public officials, photographers and others with on-the-ground information about the fire. It didn't take long for the trio to comprehend how large and destructive the fires were. For DeWald, that moment came when Press Democrat photographer Kent Porter called in about 7am to report on the destruction he had seen in the Fountaingrove area. "He was describing these landmarks that weren't there anymore," DeWald says. "'This is gone. This is gone. This is gone.' It was the first description of where the fire had reached near downtown. It was a sobering moment in the studio where we realized the fire was here and it had hit us." The seat-of-the-pants broadcast built on itself. The more public officials and others with information about the fire appeared on the air, the more others turned to the station to get the word out. "It began on the fly and remained on the fly," Kerrigan says. "Most of the preparation involved somebody handing me a piece of paper with a note scrawled on it so I knew who I was talking to." The station become a conduit of information, receiving news and broadcasting it in the same moment. In a crowded, highly fractured media landscape, frumpy AM radio emerged as the most essential source of information about the fires. Not bad for an 80-year-old radio station using technology that dates back to the late 19th century. Kerrigan and Marques were on air until noon—for about 12 hours. DeWald pulled a 19-hour day behind the board; the next day was 17 hours. 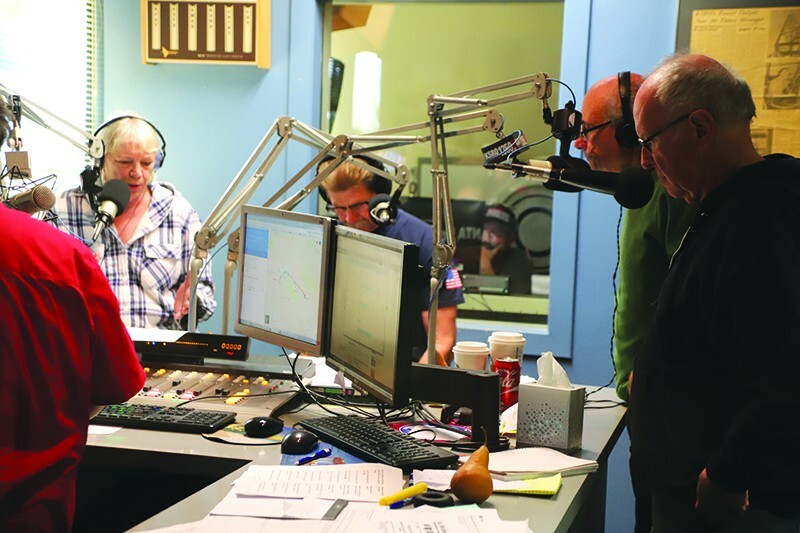 With regular programming out the window, Steve Garner, Steve Jaxon, Heather Black and others stepped in to hold down the mic. Kerrigan, whose smoky voice, at once authoritative and comforting, is now inextricably linked to the fires, doesn't know how she has a voice left at all. "It doesn't make sense. I guess that's the way it's supposed to be right now," Kerrigan says. Soon, everyone at KSRO was working long hours, answering phones, lining up guests, posting to Facebook and relieving DeWald, Kerrigan and Marques. And it continued in the days that followed before anyone could take a breath. The station went several days before they aired a commercial. "It was like a telethon in the studio," DeWald says. KSRO became the voice of Sonoma County in part because early on there was no one else able to fill that role. 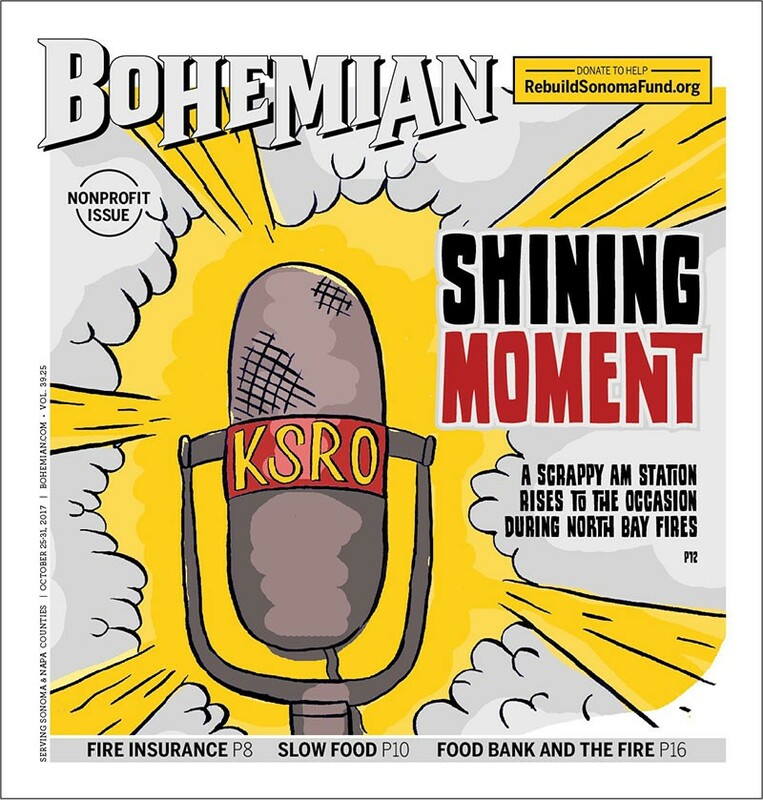 Since the fires damaged cell towers, knocked out internet service and disabled Comcast cable for many hours, KSRO 1350-AM became the first and best source for information. The station, part of Amaturo Sonoma Media, also simulcast on its four sister FM stations. KSRO was omnipresent. Unlike FM transmitters, which use line of sight to broadcast their signal and must be erected on mountaintops and ridges, AM transmitters are located in lowlands, because AM radio waves travel near the ground. KSRO's transmitter was well out of the path of the fire on Stony Point Road near Highway 12. The station is required by law to drop its signal from 5,000 watts to 1,000 at night, except in cases of emergency. "That's what we did," says Michael O'Shea, Amaturo Sonoma Media president. "We broadcast at full power 24/7."